This is the time of year when the Christmas-industrial complex begins revving up in earnest and you realize, with a sinking certainty, that you will soon be awash in good cheer and glad tidings, whether you’re in the mood for them or not. But this is also the time of year when Ryan Landry and the Gold Dust Orphans can be relied on to counteract that surfeit of sugary sentiment by teeing up a brand-new holiday-themed musical parody, written by Landry, that is spiked with more than a little merry malice. Neither Landry nor his Orphans have ever had any difficulty choosing which side of the naughty-or-nice line to stand on. For his latest effort, Landry has chosen to deliver season’s bleedings (sorry) by dipping into the horror genre for “A Nightmare on Elf Street,’’ inspired, obviously, by “A Nightmare on Elm Street,’’ Wes Craven’s 1984 slasher flick about Freddy Krueger’s dream-rampage of revenge. In “Elf Street,’’ directed with propulsive force by Kiki Samko, a mysterious, Freddy-like figure, blade fingers and all, has begun bloodily dispatching students of the Elf Street Academy. Because the newly deceased are members of Santa Claus’s flight team, this places Christmas itself in sudden jeopardy. What nefarious figure — or figures — is behind these murders? Who is playing these lethal reindeer games? 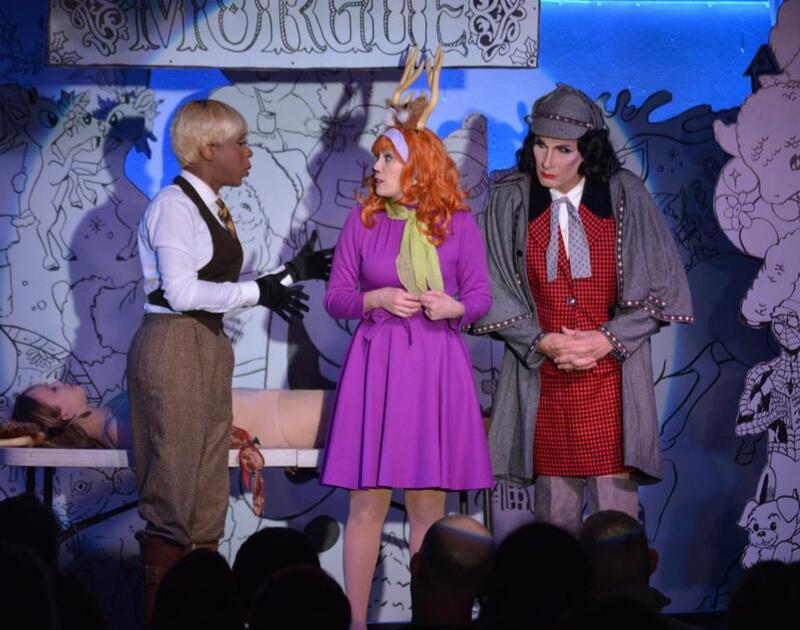 Finding the answer, solving the crimes, and saving Christmas is self-evidently a job for Detective Shirley Holmes, played by Landry himself in a deerstalker cap and gray cape, and his scathingly sarcastic helpmeet, Dr. Jodi Watley (the ever-elegant Qya Cristal). So, posing as the least plausible exchange students ever, Holmes and Watley go undercover among the high-school-aged reindeer. While Landry has written tighter and funnier scripts, he shows few signs of creative exhaustion; “Elf Street’’ displays enough of his trademark off-the-wall inventiveness, knowing cultural references, and flat-out raunch to satisfy Orphans loyalists. From a big-picture perspective, Landry’s willingness to put himself on the line, show after show and season after season, deserves respect. Also, how many other writer-performers would be self-deprecating enough to allow themselves to be described as “that fat bag of tweed’’ — by a puppet, no less — the way Landry does in “Elf Street’’? While supplying the lyrics himself, Landry borrows melodies from an eclectic array of genres for the musical numbers, from rock ’n’ roll (e.g., Alice Cooper’s “Welcome to My Nightmare’’ and Lita Ford and Ozzy Osbourne’s “Close My Eyes Forever’’) to classic holiday songs (“Rudolph the Red Nosed Reindeer’’) to musical theater (“Façade,’’ from “Jekyll & Hyde’’). As usual, the cast dances their hearts out; as usual, a Whitney Houston-ish solo by Cristal is a late-in-the-show high point; and as usual, the great Scott Martino has designed costumes that are a performance in themselves while also emerging as a standout in the cast. Veterans like Martino, who lends a Joan Crawford imperiousness to his portrayal of the ruthless Velma Vixen, and Tim Lawton, who plays both Santa and Rudolph, are ably complemented by the younger members of the large cast. They catch on quickly to the performative balance required in an Orphans show between rumbustious camp and zealous professionalism.